Avaya IP Office, Specialists in Avaya Telephone Systems. We supply the industry-leading IP Office that can transform your business for the better. Solution IP are specialist Avaya IP Office business telephone systems suppliers. We are experts in installing and training users on the award-winning Avaya IP Office business communications system. We can tailor the system to fit your business needs, and everything is fully maintained and supported by our expert team of in-house engineers. Avaya’s IP Office solution aims to encourage collaboration by bringing together Voice, Video and Mobility across a variety of devices. Reduce the cost of your business communications, taking advantage of video conferencing, VoIP Telephony and Unified Communications. Ensure business continuity, even in the event of a power outage or switch failure: users can automatically failover to another location’s switch with the aid of backup servers. Centralise the administration of your multi-site business communications, making it more straightforward and therefore easier to manage. Make the most of enterprise mobility and enable your staff to connect with their colleagues and clients, no matter where they are. Increase productivity by giving your staff the flexibility to work from almost any device, using voice, video, chat or email functionalities. All of the above benefits ultimately contribute to giving your customers the best possible experience when dealing with your business, thus helping you to stay ahead of the competition. IP Office from Avaya is a business communications solution (read our product review to find out more) that is aimed at growing businesses everywhere.The flexible Avaya telephone system is one of the most reliable, feature-rich communications solutions available. A phone system designed with the mid-market company in mind, it increases productivity and enhances collaboration by bringing together voice, video, and mobility on almost any device. Your workers can work anywhere, at any time, from any device, whilst remaining connected to your business telephone system as they would be if they were in the office. Most importantly, you control over the experience your customer gets when they call you and, as a result improve customer engagement levels. 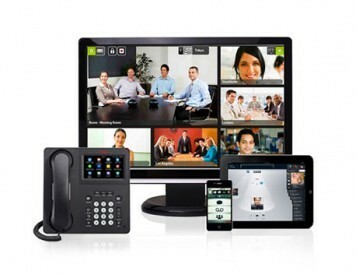 IP Office can be deployed in a number of ways- via PBX, or a virtual/hosted version that runs on a Server. The traditional PBX approach can support both digital and analogue lines and handsets, where the virtualised version is more suited to IP handsets. The system can support up to 2,000 users, depending on the size, make-up and objectives of your organisation. It is an easy to use, easy to manage solution that can add real value to a business. Staff can connect from anywhere, be it when hot-desking in different offices or when logging on from their own home. Choose a hold music that reflects your company’s individual qualities with multiple sources to choose from. Personalised mailbox and Voicemail to email can be deployed on an individual or company-wide basis. Choose from our range of easy to use handsets, including the 1400 digital series, 1600 IP series and premium 9500 and 9600 deskphones. Plan your internal or external conference calls in advance or set one up ad-hoc, as and when needed. Incoming calls are answered with a pre-recorded professional message or a customised greeting. Options for extensions or groups are also available. Phone lines can be controlled around the clock on an individual, group or company-wide basis. Bring Your Own Device (BYOD) and enterprise mobility are supported with Avaya’s One-X application. IP Office 500 and the Server Edition can both be based on your premises, or in an external data centre for extra peace of mind. For more resilience, multi-site companies can choose to have one centralised system, rather than individual ones at each site. Virtualised Server Edition can be deployed using existing VWware or virtual PBX. We provide a range of other Avaya solutions, including Avaya Server Edition for IP Office, which uses a normal server rather than hardware and is ideal for any sized business wishing to embrace Unified Communications or the Cloud. The Scopia solution offers enhanced Video Conferencing, and the Avaya One-X portal is an application that allows users to control their phones easily from a PC. Avaya’s business telephone systems are ideally suited to SMEs, Mid-market companies and large-scale organisations, due to their enhanced range of features, ease of installation, configuration and scalability. As an approved IConnect Partner, we are experts in helping SMEs and Mid-Market clients to integrate any of these Avaya phone system solutions into their business, and enhance productivity and flexibility. See how we helped client Pet Drugs Online with our Avaya expertise.